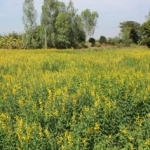 An Ally in the War Against Nematode Pests: Using Sunn Hemp as a Cover Crop to Suppress Root-Knot Nematodes. Incorporating Crotalaria Juncea to the soil, after 60 days of being sowed, prior to planting vegetables. Clewiston, Florida, August 7, 2017. Planting rice after Crotalaria, produces greener crops, healthier plants and higher seed yields!